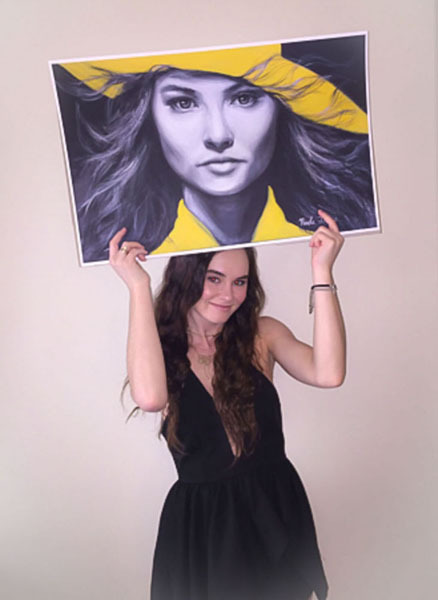 Rising star, Madeline Carroll, opens up about her life as an actress and some of the most famous Hollywood talent she’s worked with over the years. But most importantly she shares something deeper, an important aspect of her life that pushes her though the tough times, giving her hope, joy and something more fulfilling than Hollywood or fame. A native of Los Angeles, California, Carroll began her acting career as a young child, working with some of the biggest names in Hollywood. When artist and writer, Nicole Troup, became acquainted with Carroll and her story, she saw nothing short of someone who is beautiful inside and out and worth telling about. 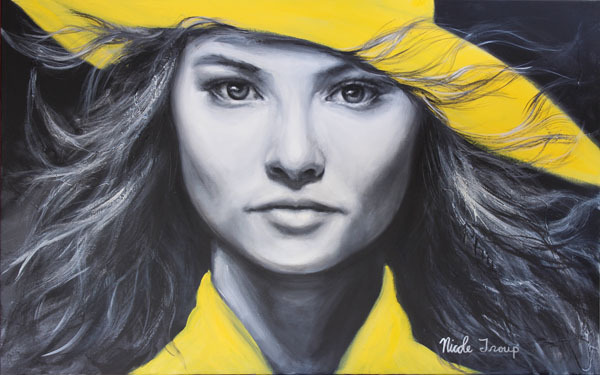 As a visual artist who paints influential figures on canvas, Nicole knew Carroll would be a perfect subject for her next portrait to be showcased in her future NYC art show series titled “Deeper Than Fame.” The show will depict influential public figures and celebrities that Nicole has partnered with. Subjects, who have something to share, a story that goes much deeper and offers fulfillment that goes beyond any fame, money or what any celebrity life style could give. NICOLE TROUP – Tell me about your upbringing and how you broke into the movie business. MADELINE CARROLL – I was in a nail salon in Los Angeles when I was three years old. I talked a lot as a kid and it just so happened that the woman sitting behind me was a talent agent. She heard me talking and turned around thinking I was about six or seven years, but to her surprise it was just little three year old me. She wanted my mom to bring me by the agency so she did. They ended up signing me to the agency and I have been acting ever since. What is your film history and what Hollywood talent have you worked with? I have been acting most of my life so I have had opportunities to work with many Hollywood talents such as: Rob Reiner, Michael Forester, Joshua Michael Stern, Michael Waters, Kevin Costner, Gerard butler, Dennis hopper, Nathan lane, Stanley Tucci, Dennis Quaid, George Lopez, Jackie Chan, Jim Carey , Tim Allen, Patrick Dempsey, Tim Roth, Carla Gugino , Amber Valetta, Kelsey Grammar, and Michael Shannon just to name a few of them. I have been so blessed to work with all lovely people and I haven’t had any bad experiences. What movies are you currently working on? Last year I received a wonderful opportunity to work on a faith based film called “God Bless the Broken Road” directed by Harold Cronk (he directed the “God’s Not Dead” films ) and it opened the door for me to start a whole faith based film chapter. This was a turning point for me, because I was thinking about quitting acting altogether. But I prayed about it and felt God moving me in this direction! After the movie “God Bless the Broken Road,” I was in the movie “I can only imagine” directed by Jon and Andy Erwin “Woodlawn” and then the movie “Indivisible” produced by Sarah Drew (“Grey’s Anatomy” star). I just wrapped a film called “Pistachio” with Denise Richards, directed by my first female director, Anna Elizabeth James! It’s been a good year, God has moved so much in my life and I am so thankful. Tell me about your faith and the greatest lesson you’ve learned in life? I have always been a believer in Christ since I was little and have developed my own relationship with him when I was around nine years old. I just knew God was always real in my life. One of the greatest lessons I’ve learned is that at the end of the day everything comes from God. You can try your hardest, but it is up to God to do the rest. I pray all the time for God’s will in my life and for him to open and close the right doors, because his ways are higher than our ways and his thoughts higher than our thoughts (Isaiah 55:8-9). One movie in particular that you had a role in stands out to me and that is the “Machine Gun Preacher” starring Gerard Butler. This tells the true life story a man named Sam Childers (aka Machine Gun Preacher) who left his drug and crime fighting ways to become a Christian and then rescue children from the war in South Sudan. In what ways has this powerful story of Sam impacted you? I still remember reading that script to this day. I was so moved by it that that it brought my mom and I to tears when reading it. It opened my eyes to the suffering that was out there that I didn’t understand before. We know people are hurting all around the world but I didn’t know about Sam Childers story (founder of Angels of East Africa) and the children that were suffering in South Sudan. I remember thinking to my self that “I have to book this movie and tell this story because it is too important.” I was so blessed to be a part of that movie and with everyone involved in it. My favorite part was meeting Sam. He is an intimidating person but has a courageous, sweet and lovely side to him. It is amazing to see people risking their life to help others. That is characteristic of a true servant. What are your thoughts about the painting and most importantly what do you think it captures about yourself? I love the painting and cannot believe someone painted me. I haven’t had that done before so I was thrilled when you asked me. This is a great way to get my story and message of faith out there. I think the painting captures my strength and the struggles I’ve went through in life and the movie business. It has been very tough and a lot of people don’t understand it. I have been practicing resilience for years so it is very hard. In the painting I also see peace and joy and that the hardships don’t happen for no reason! What hidden message is in the painting and what does it mean to you? Another one of my favorite verses that I feel speaks loudly in the painting and in the expression is: “No weapon that is formed against you will prosper; And every tongue that accuses you in judgment you will condemn. This is the heritage of the servants of the LORD, And their vindication is from Me,” declares the LORD. These are a few of my favorite verses and ones that I pray about all the time! The painting will be showcased along with your story in my future art exhibit along with other portraits of public figures and celebrities and their stories. How do you hope your story speak to others? I hope I can help inspire others to be bold for God, because when you are bold for Him, He will be bold for you. God has shown up for me every time I’ve ever put him first. ALWAYS. When we are with him we are the head and not the tail. We are above and not beneath. I want people to choose not to compromise their faith but choose to fight the good fight. It is easy to go along with the crowd but hard to be set apart which is far more rewarding. What goals or dreams do you hope to achieve in your life and career in the future? I want to act, write, direct and produce wherever I feel God leads me to go. I would love to also start making my own films one day. Hopefully that will happen soon. I want to have my God given life not my Madeline chosen life and pray I am able to do it all to the fullest extent.